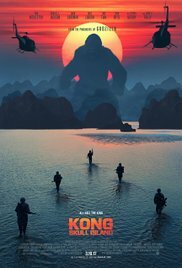 The movie Skull Island, much like the fictitious island of the same name, is something you should stay far, far away from. Unless all you are interested in are mindless CGI fight scenes between monsters, this movie offers nothing for you. The movie boasts a strong cast including Tom Hiddleston, John Goodman, Samuel L. Jackson, and Brie Larson, but even this all-star cast is not enough to save the film. The dialogue is dreadful, the plot and the premise are full of holes, and the film is choppy, rushed, and littered with cliches. In scenes that were supposed to be dramatic and tense, the film forces awkward comedy lines on us which fall flat and had me shaking my head. Sure, Kong looks good and so do his enemies, but this monster movie is scary for all the wrong reasons. And I just have to say this to Samuel L. Jackson: You are a fine actor. Stop agreeing to do terrible movies. There is also an after credits scene if you choose to stick around for that and maybe the sequel can redeem this flick.